Conjunctivitis can be caused by a number of factors, to including injuries, bacteria, fungi, nematodes, and protozoa. Diagnostic testing is necessary to determine exactly what causes each case of conjunctivitis. Swollen eyes may also be caused by psittacosis (usually only affects one eye) or mycoplasma (plus myriad other health problems). Traditional Treatment Protocol: If it is mycoplasma, a vet would typically prescribe Tylosine or Doxycicline (antibiotics) - both of which can usually be purchased at a pigeon or chicken supply store. Dr. Cindi Bossart of Fort Lauderdale, Florida, has developed a spray that has shown effectiveness in treating conjunctivitis or chronic sinusitis. Spray mixture 2-3 times a day, getting the bird very wet (head, eye area, even mouth without drowning). Keep bird warm after spraying. Eyebright (Euphrasia officinalis) - also commonly referred to as Eyebright Meadow or Eyebright Red. Botanical blend sold as an eyewash. One of the best remedies for pets (including birds) with eye problems, such as conjunctivitis, blepharitis of the eyes, infectious and allergic reactions affecting the eye. Caution is advised when using the eyebright herb in the treatment of dry and stuffy congestions, even though the eyebright is capable of alleviating liquid mucous, the astringent quality of the herb can often worsen dry or stuffy disorders in the inflamed tissues. 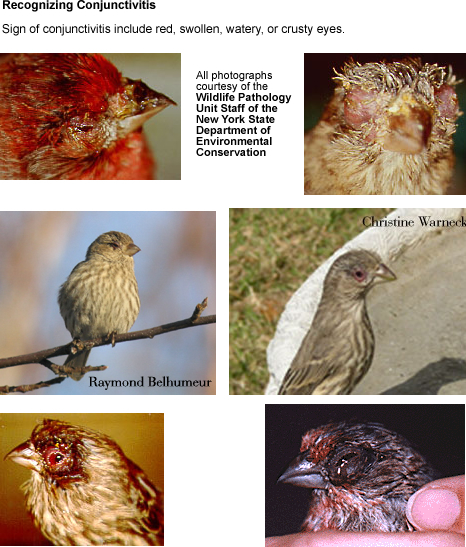 Originally this disease affected mainly domestic turkeys and chickens, but this disease has been observed in House Finches since the 1990s and also affects several other species, including - but not limited to - American Goldfinch, Evening Grosbeak, and Purple Finch, to a lesser degree. 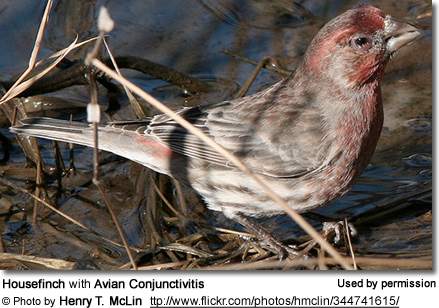 Often observed in birds at bird feeders or water baths - both of which are implicated in the spread of this disease. Once this disease is observed in your garden, any bird feeder and bird bath should be removed for at least a couple of weeks and thoroughly sanitized before reusing. 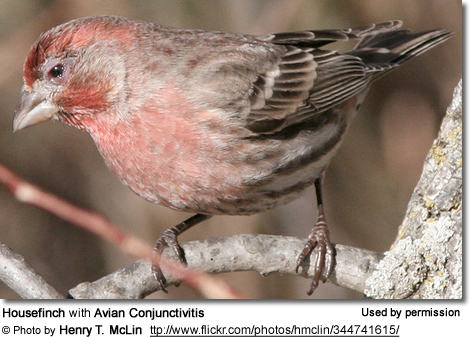 You can help monitor the spread of this disease by contributing to the House Finch Disease Survey. For more information, visit the web site or call (800) 843–2473. Symptoms: Infected birds may have red, swollen, runny or crusty eyes. In severe cases, the eyes become swollen shut and the bird becomes blind and unable to fend for itself. You might observe an infected bird sitting quietly in your yard, clumsily scratching an eye against its foot or a perch. While some infected birds recover, many die from starvation, exposure, or predation.